The recent development of distal chip endoscopes and the inclusion of a working channel have expanded possibilities for the outpatient diagnosis and management of laryngeal disorders. This literature review aims to determine the clinical indications for three office-based procedures, namely, flexible endoscopic biopsy (FEB), vocal cord injection, and laser surgery. The authors explore advantages of each office-based procedure over its standard operative counterpart. The researchers also provide extensive procedural summaries of each method, to be used as guidelines for physicians performing these office-based techniques. A review of literature on office-based procedures in laryngology and head-and-neck oncology was conducted using PubMed (Medline), EMBASE, and Cochrane Library databases. Of the 3715 articles generated by the search, 88 of the most pertinent full texts were ultimately included in this review. Performed transorally or transnasally, FEB was used for biopsies and polypectomies of benign and malignant laryngeal lesions. One study on office-based upper airway biopsies by Lippert et al. revealed a shorter time-to-onset of treatment for patients who underwent office-based biopsy (24.2 +/- 13.9 days) as compared to those who underwent operating room (OR) biopsy (48.8 +/- 49.4 days). Potential procedural complications included vasovagal reaction, epistaxis, post-procedure aspiration, and bleeding at the biopsy site. Overall, patients tolerated FEB under local anesthesia well. Costs of in-office biopsies were found to be significantly lower than those of OR biopsies, and efficacy was similar for both modalities. There were two main indications for vocal cord injection: augmentation (therapy for dysphagia due to vocal cord paresis or paralysis) and pharmaceutical administration (use of Botox for spasmodic dysphonia or use of steroids for vocal cord nodules). Routes and depth of injection, along with choice of injectable material, varied widely based on clinical indication and/or physician preference. Vocal cord injection augmentation was shown to improve both subjective and objective voice quality assessments. Furthermore, office-based vocal cord injection was found to cost up to thousands of dollars less than OR-based injection. A meta-analysis by Wang et al. demonstrated an effective improvement range between 82% and 98% for pharmaceutical vocal cord injections for benign lesions. Despite the possibility of complications such as respiratory obstructions or scar formation, office-based vocal cord injections were uneventful in the majority of studies. Carbon dioxide laser, pulsed dye laser (PDL), potassium-titanyl-phosphate (KTP) laser, yttrium-aluminum-garnet (YAG) laser, and flexible endoscopic laser surgery were all used for office-based surgery of the aerodigestive tract. Indications for laser surgery included laryngeal granuloma, recurrent respiratory papillomatosis, laryngeal cyst, and benign or malignant tumor. Each modality was associated with specific advantages, disadvantages, and potential procedural complications. However, overall, these office-based procedures were no less safe or effective than similar OR-based procedures. FEB, vocal cord injection, and laser surgery are well-established office-based procedures that exhibit good patient tolerability, similar safety and efficacy profiles, and major cost benefit as compared to standard operative procedures for laryngeal disorders. Office-based procedures under topical anesthesia are advantageous for myriad reasons; they are associated with decreased time to diagnosis and treatment, shorter procedural length, and fewer health risks than when generalized anesthesia and rigid endoscopy are used. In addition, they enable patients to be awake to perform various throat movements, thereby improving access to the lesion in question. The studies reviewed here are insufficient to evaluate these three office-based procedures. Randomized controlled trials are necessary to determine the efficacy of office-based biopsies versus OR-based biopsies, establish the most successful approach for vocal cord injections, and outline appropriate selection criteria for laser surgery treatment of benign and malignant lesions. 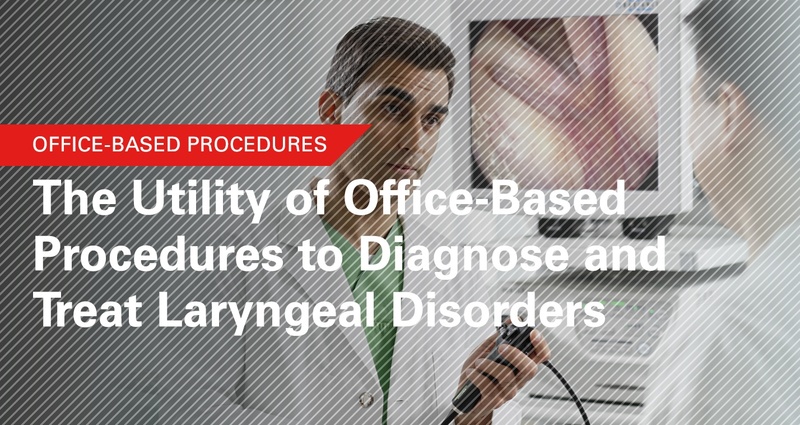 Office-based procedures are an excellent alternative to operative procedures for the diagnosis and treatment of laryngeal pathology. Flexible endoscopic biopsy, vocal cord injection, and laser surgery, all performed using topical anesthesia, allow for rapid and accurate diagnosis and management of laryngeal disorders, while conferring medical and economic benefits to patients undergoing these procedures. More high-level evidence is needed to further investigate these promising modalities. Wellenstein, DJ; Schutte, HW; Takes, RP; Honings, J; Marres, HAM; Burns, JA; van den Broek; GB. “Office-Based Procedures for the Diagnosis and Treatment of Laryngeal Pathology.” Journal of Voice 2018; 32(4): 502-513. Accessed September 11, 2018. Want to learn more? Fill out your info to get updates and exclusive content. © Copyright PENTAX MedicalAll Rights Reserved.